Americorps team members fan out in Madras, Prineville to replace incandescent bulbs with LED bulbs. 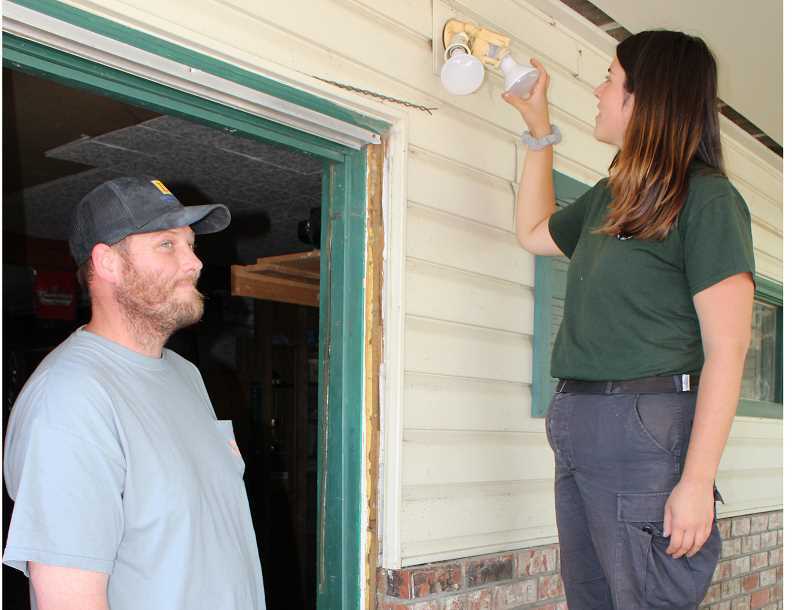 A dozen Americorps program members will be in Madras and Prineville through May 24, installing up tp 16 free LED lights, as well as water-saving fixtures, at area residences. Thanks to a partnership among Energy Trust of Oregon, Central Electric Co-op and Pacific Power, the Energy Challenge of Central Oregon is back with its popular LED installation program. Local residents can sign up and schedule an appointment at www.theenergychallenge.org/freebulbs. "It's a good deal," said Matt Hunt, of Madras, who saw an article about the program in the Madras Pioneer and immediately signed up for the free LED bulbs. The team installed 13 new bulbs at his home on Glass Drive last Thursday. The bulbs, which can last more than 20 years, use about 80 percent less energy than a regular incandescent bulb and allow homeowners and renters to save money on their electric bills. Since the LED Program started in 2015, volunteers have installed 60,000 energy-efficient LED (light-emitting diode) light bulbs in more than 4,400 Central Oregon homes, potentially saving Central Oregonians more than $10 million over the next 20 years. "We hope this illustrates that even your smallest actions add up to something much bigger than yourself," said Neil Baunsgard, project manager for Energy Challenge. "When you're making changes to save energy, however small, you're both saving money and you are truly are making a difference." In addition to the light bulbs, the program has installed more than 1,800 high-efficiency showerheads and showerwands, which increase energy savings and ease the impact on septic systems. Team leader Emily Giarratana, of Avon, Connecticut, is overseeing 11 other members of the National Civilian Community Corps — an Americorps program for young people from 18 to 24. "We've done about 62 installations in the first whole week," she said Tuesday morning. "We are getting a lot of sign-ups." To spread the word, team members have been going door to door in some areas. Giarratana hopes that people will continue to tell their friends and neighbors about the program. "When we go to their houses, we also ask if they want information on energy-saving upgrades, such as heat pump water heaters and solar assessments," she added. Giarratana's team, based out of Sacramento, California, recently returned from a two-month stint in Puerto Rico, where they cleaned and gutted homes, damaged by Hurricane Maria in September 2017. She encourged local residents to check the website at www.theenergychallenge.org/freebulbs to see if they qualify for the program.